TORONTO (CNS) — The Paulist Fathers don’t want to leave Toronto, but they say they must. The unusual uptick in vocations after the World War II has worked its way through the system and there are not enough priests left to staff the ambitious little empire of Paulist ministries that once dotted cities across Canada. So, after a century in Toronto, the U.S.-based Paulists are going home. Paulist ministry in Canada — which once included parishes, university chaplaincies and Catholic Information Centers in Vancouver, Toronto and Montreal — was not an anomaly for the order. Founded in New York in 1858, the Paulists were never shy about crossing the border. The first time was on an open sleigh in the middle of a snowstorm in 1859. The driver of the sleigh was having no mercy on either the horses or the white-knuckled evangelists behind him. “To one unacquainted with the mysteries of Canadian horsemanship, the speed suggested that the drivers all had bad consciences and that the devil was behind them,” wrote Father Augustine Hewit after the Paulists arrived in Quebec City. The Paulists did not arrive with just the zeal of missionaries. They brought with them an insight about the church. The original Paulist, Father Isaac T. Hecker, who was not born Catholic, saw that the church was not just its cultural legacy, as precious as that may be. For Father Hecker the church had to be alive in every culture and every period of history. Father Hecker managed to bring down the wrath of his first religious order in the 1850s by showing up in Rome with the idea that there should be parishes in North America conducting everything in English. That got him kicked out of the Redemptorists, but led directly to him founding the Missionary Society of St. Paul the Apostle. “Hecker’s idea was to take the values he could see in Catholicism and in the American system and broaden it, bring it elsewhere,” said Paulist Father Jim Haley, who has ministered in Toronto for decades. Father Hecker understood that North American cities and the democratic spirit in English-speaking North America had a lot to do with a Protestant model. The challenge was how to evangelize such a society. Parish missions were the first Paulist answer. Though some of the missions followed the Redemptorist model aimed at reviving the spirit in existing parishes, the Paulists also appealed to Protestants and looked for opportunities to speak to non-Catholic audiences. They were doing it in Montreal as early as 1892. 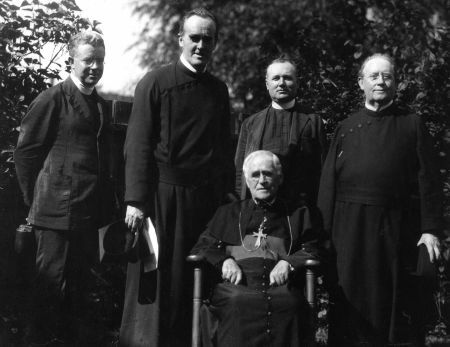 In 1911, Father Thomas Burke and his mission team came to Montreal and he delivered more than 50 sermons during Lent and Easter to Catholics and non-Catholics. In 1912, he brought the same team to Toronto, speaking at three parishes. But the Paulists also saw that in addition to preaching missions, bringing the church into North American culture required an outreach to the best and brightest young minds. Campus ministry became a Paulist apostolate in 1907 in the U.S. and then to Toronto in 1913 with the opening of a Newman Center. Eventually, the Paulists would minister at McGill University in Montreal and at Simon Fraser University in Vancouver. But there had to be a way of getting beyond the elite and a way of reaching Protestants who were unlikely to wander into a Catholic church. In the age of radio and the silver screen, public lectures began to lose their appeal. So in the 1930s the Paulists started to open Catholic Information Centers in New York and Austin. When Canadian-born Paulist Father Frank Stone finally got the Catholic Information Center built in Toronto, it soon became a leader. Father Stone was a gifted evangelist who as a young priest was permitted to focus exclusively on encouraging non-Catholics to join the church. In 1946, his first year working in the ministry, he brought 100 people into the church. He then took his message to radio and newspapers and later he became director of the National Catholic Communications Center, produced radio and television broadcasts and chaired the Canadian Broadcasting Corporation’s National Religious Advisory Council in the 1960s. But by the 1970s, Vatican II also became the undoing of the center. When the Rite of Christian Initiation for Adults came to every parish, the Paulists and the centers were no longer the focal point of evangelization. The first time a young Father Haley came to Toronto as an associate pastor at St. Peter Parish, it was an opportunity for the Nova Scotia-born Paulist to experience multiculturalism up close. In 1973, St. Peter had Masses in Italian, Portuguese, Spanish and English. Over the years, the downtown parish changed. Immigrant families moved to the suburbs. Today, it’s an exclusively English-speaking parish, and the surrounding Annex neighborhood has become an expensive, gentrified corner of the city. So the challenge has shifted again. Where once the Paulists sought to attract non-Catholics to become Catholic, they now ponder the universal shrug of a secular society, Father Haley said. Although the Paulists are leaving Canada, they eye returning someday.